Do you celebrate Halloween? 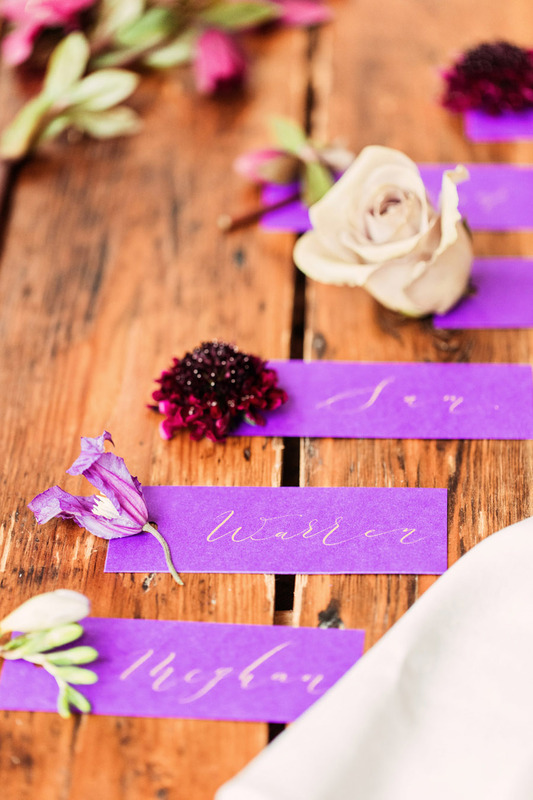 Here at English Wedding HQ I love the old belief in fairies and spirits – it’s said they can reach us more easily tonight than at any other time in the year… so I see it as a time to pray for loved ones lost; to celebrate their lives and look back on precious times and memories shared. It’s also a lovely opportunity to cook pumpkin stuff – I actually spent a few happy moments writing on a little pumpkin in my calligraphy class the other week! Anyway – before I begin today’s blog post I have a request for wedding stylists and photographers – I would love to feature this year’s Halloween weddings on the blog this time next year. If you’re styling or shooting a wedding today, please consider submitting it for publication on English Wedding next year. We don’t need ghosts and goths (although, that would be pretty awesome!) – I’m looking for weddings with orange, autumnal or pumpkin styling ideas to inspire our readers. Thank you! 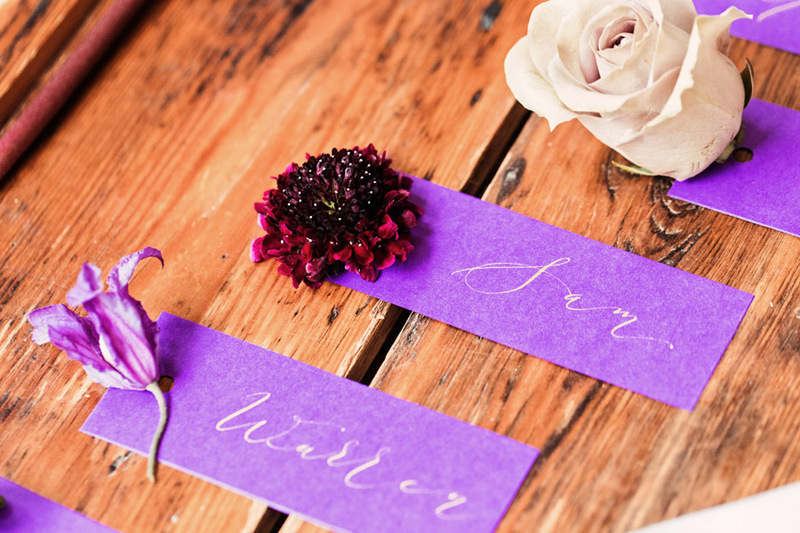 Now on to today’s feature… many of you will know calligraphy is my second favourite thing, and at this time of year it’s lovely to share ideas in warmer, brighter, more vibrant colour ways. 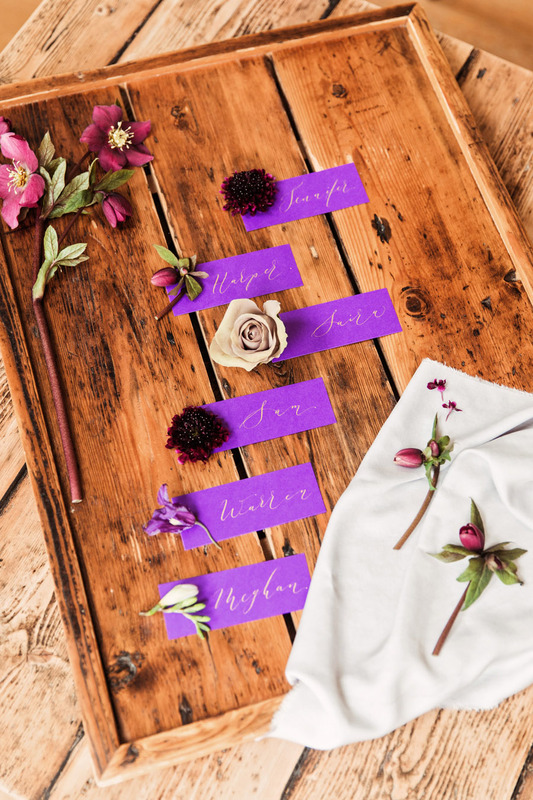 These place names were created especially for the photoshoot I styled for Lakes & Cumbria Wedding Magazine back in the spring, and I loved working with the creative team of wedding suppliers involved in this shoot – their names are listed below. 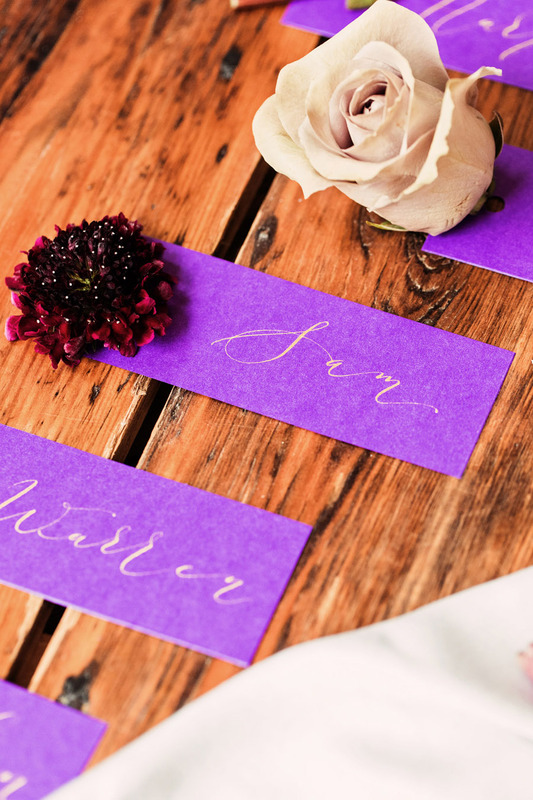 These place names make striking statements for autumn and winter weddings, and all are handwritten in gold ink on a rich, luxe purple card. 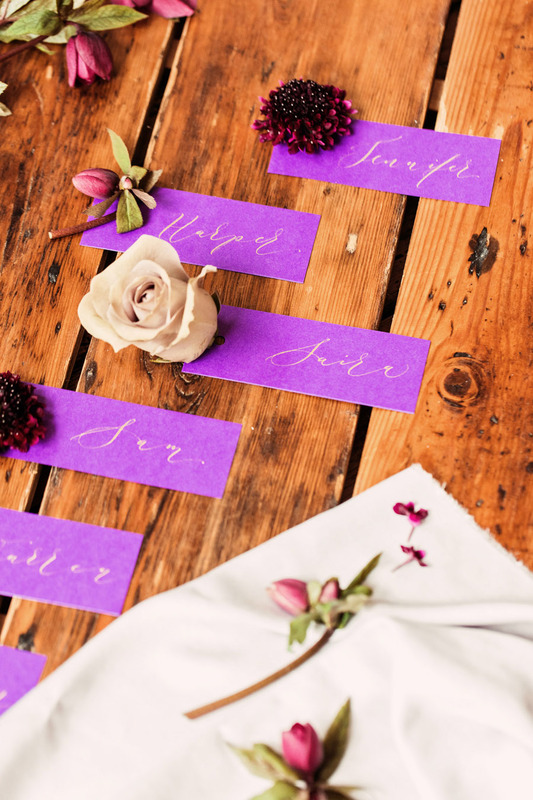 The calligraphy style is modern and relaxed, with an elegant slant and gentle flourish to the lettering. If you’d like to order wedding place names you can either email me, buy online in my Etsy shop, or give me a shout over on Instagram or Facebook. 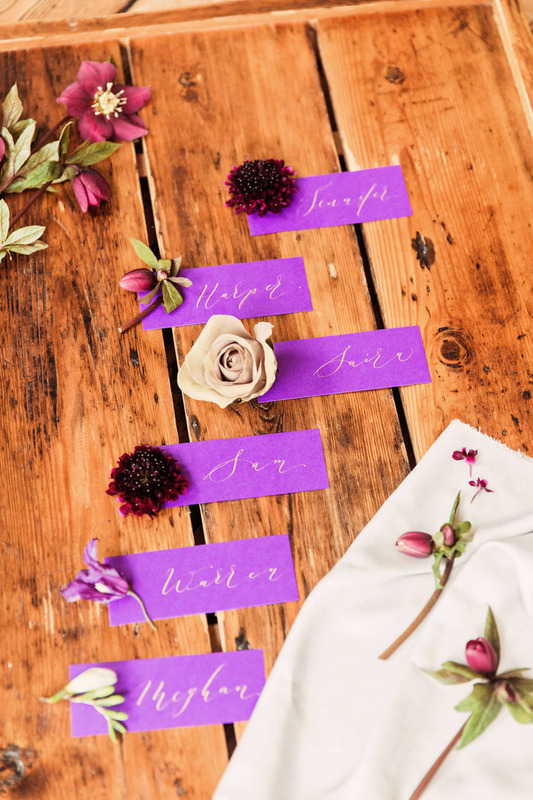 I’d love to help – and I can adapt these cards to any wedding colour palette or style! Thank you to lovely Camilla Lucinda Photography for the images and for being such a superstar on our photoshoot! Thanks also to Katie from Made in Flowers for decorating everything so beautifully, to The Forest Side for hosting us and of course to Lakes & Cumbria Wedding for letting us help launch their first ever issue with our styled shoot! The rest of our team (not pictured, but equally fabulous and inspiring) were our model Jade, boutique owner Julia Tasker, make up artist Keseme Goodwin and hairdresser Ashley Taylor. 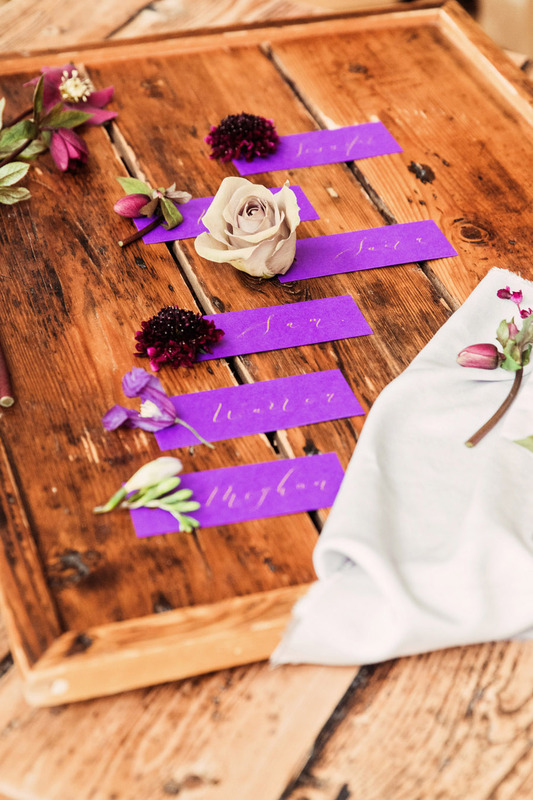 « Beautiful weddings and mindfulness for brides, from the Hampshire Wedding Club! 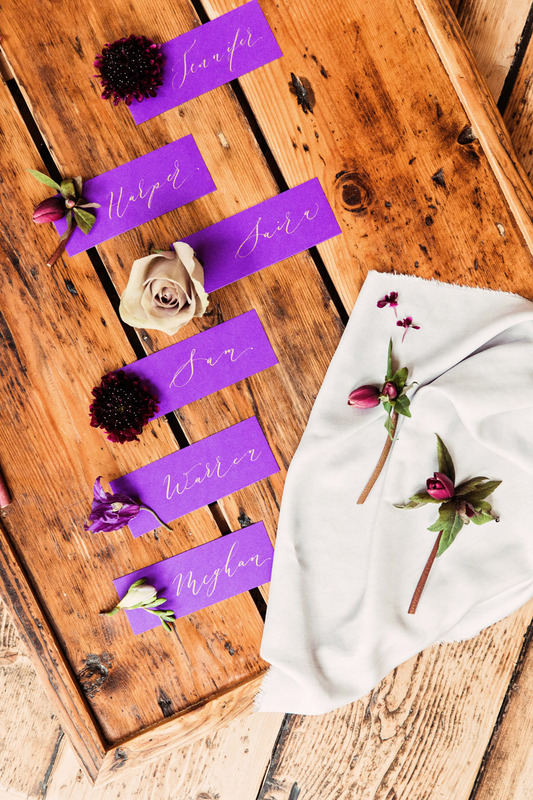 Manchester calligraphy workshops – photos and new dates!